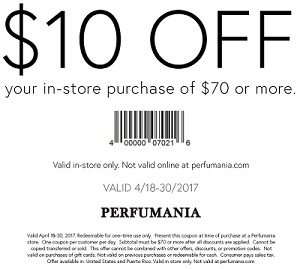 Have you already heard about the possibility to save money with in-store printable savings pass at Perfumania stores in the U.S.? You have an unique chance to take $10 off your in-store purchase of $70 or more. To receive the offer present in-store savings pass to cashier. Print Perfumania in-store savings pass right now. Source of the information is Perfumania. Offer is valid until April 30, 2017. More details available at U.S. Perfumania store locations and U.S. Perfumania online.